Got this ever since the video player change. Tried resetting cache, another browser, resetting computer, on mobile, etc. Nothing will work, i just get this white screen with nothing to load. Any help would be appreciated!! and yea i have premium. Same happen to me. However, when I turned off my Freedrome protection, the video came back, but it was not the same video player, but a rather shittier one (awful quality). 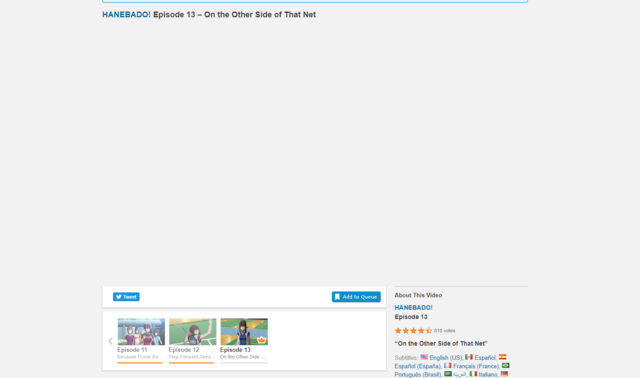 I don't know what's going on with Crunchyroll, but it's annoying, since I'm paying for this. I don't want to risk getting viruses either, by turning off my protection. Never been a problem having it on before. The old player (which is gone for good at this point) was the Flash player. The new player is an HTML5 player, and like many of those, determines the quality your connection can support automatically. Those don't always get it right, and seem to more often than not start out at poor quality and then ramp up. (When I view titles at Funimation, for example, their playback typically looks terrible for the first several seconds, and then clears up. Fortunately they have their logo and often a publisher's logo at the beginning of each episode). The only way you might be exposed to any "virus" on CR would be via malicious advertising, and as a premium user, you aren't going to see ads on video pages, or in the video. (The current Anime Crimes Division is an internal promotion of a show on CR). My own opinion on most security software aside (i.e., the sense of false security they give many users), if security software stops a website from functioning properly, I see that as a flaw in the software, more than a flaw in the website. I'm also not able to see the player. I'm not running any AV other than windows defender and I'm using adblock and pihole but I disabled both of those and still get nothing. I tried on chrome, edge and firefox and in all 3 it looks just like it does in the screenshot up above.